Monsanto, as most of you may already know, has long been referred to by those in the know as "the most evil company on the planet." But it has stiff competition. Before there was Monsanto, junk food companies were already hard at work influencing American politics to further their own agenda. The latest developments in the fight for GMO labeling actually makes a strong case for giving the title of "Most Evil Organization on the Planet" to the Grocery Manufacturer's Association of America (GMA), which represents the processed food leaders, including Pepsi, Coke, Kraft, Kellogg's, and General Mills. The Grocery Manufacturer's Association also lists Monsanto as a member, so it would make sense that the sum would be greater than the parts. This organization is no stranger to stooping way down low to protect their members' interests—your health and human rights be damned. And that is, in my opinion, evil. Several major food companies experienced massive backlash and consumer boycotts once their contributions to the anti-labeling campaign in California (Prop. 37) in 2012 became widely known. This was a fate they all wanted to avoid, no doubt, and to prevent you from knowing which companies funded the anti-labeling campaign in Washington State, the GMA create a "brand defense" account, which paid for the campaign's propaganda without disclosing where the money came from. Lawbreakers or not, the GMA's work continues unabated, and job number one is to keep you as uninformed about GMOs as possible. This was clearly evidenced in heavily redacted documents4 released through the Attorney General's investigation of the GMA money laundering scheme. A previous Politico report5 revealed that a key aspect of the GMA's plan for combating GMO labeling efforts across the US included the pursuit of statutory federal preemption—a law that prevents a labeling requirement. A section redacted in its entirety is titled, "Examining Options for Conveying Information to Consumers"
As reported in the featured article7 and elsewhere,8 the GMA's preemptive attempts are now in full swing. As stated earlier, a major part of the GMA's plan is to prevent states from creating their own labeling laws by pushing for an industry-friendly, voluntary labeling law at the federal level. "The push for a softer national standard on GMO labeling comes as consumer interest in biotech foods has blown up into an intense national conversation, and the food industry is clearly trying to get out ahead of a strong, vocal movement pushing strict labeling requirements in multiple states around the country," Politico writes.9 "GMA's proposal is aimed at protecting its members from having to fight a series of state labeling efforts as several states..."
On December 5, 2013, the GMA sent a letter 10 to Elizabeth Dickinson, Chief Counsel of the FDA, informing her that "GMA will be filing a Citizen Petition early in 2014 that asks FDA to issue a regulation authorizing foods containing ingredients derived from biotechnology to be labeled "natural." "Consumers and the food industry would all benefit from uniform legal requirements and the consistent outcomes that result from federal regulations, rather than state-by-state dictates... As such, federal rulemaking is needed here so that the issue of whether foods that contain ingredients derived from biotechnology can be labeled "natural" is removed from judicial or state interpretation..."
Washington's law requiring the GMA to secure $10 in donations from 10 separate registered Washington voters as part of its political committee before donating to another political committee"
"After breaking our state's campaign finance disclosure laws, the GMA now seeks to have them declared unconstitutional. I look forward to defending transparency in Washington elections." Preventing Foodborne Illness through Vaccinations. Vaccinations and inoculations can be an effective tool for preventing foodborne illness outbreaks, however employment and labor laws create a significant hurdle to this approach. For example, Hepatitis A is the cause of numerous outbreaks every year. A simple vaccination for food service employees would greatly reduce this risk, however current labor laws prevent employers from forcing the vaccination on employees. This session will explore this and other methods for preventing foodborne illness outbreaks, and how these approaches are impacted by employment and labor laws. Trans Fats and Beyond: Anticipating the Next Generation of Industry Risks. The FDA's recent decision regarding GRAS status for partially-hydrogenated oils (PHO) containing trans fats may be just the tip of the iceberg if consumer groups and plaintiff's attorneys have their way. This presentation will discuss the litigation and regulatory implications of FDA's PHO decision, the increasing power and tactics of CSPI and other consumer groups, and the next generation of risks to face the food industry, such as the Pew Food Additives Project, challenges to GRAS self-affirmation, nanotechnology, pesticide residues, and involvement by state attorneys general in false labeling cases. An article written in 1950, titled "The Battlefront for Better Nutrition,"14 clearly shows just how little has changed in the past 60 years, and how the junk food industry has had full control of our federal food policy this entire time. As you can see by the following excerpt, the corruption was already well-recognized 60 years ago, yet has been allowed to continue to flourish and grow with each passing year. Truly, as Dr. Wiley sadly remarked in his book The History of a Crime Against the Pure Food Law (1930) the makers of unfit foods have taken possession of Food & Drug enforcement, and have reversed the effect of the law, protecting the criminals that adulterate foods, instead of protecting the public health." It's time we started to make real change, and we need to take that upon ourselves first and foremost. 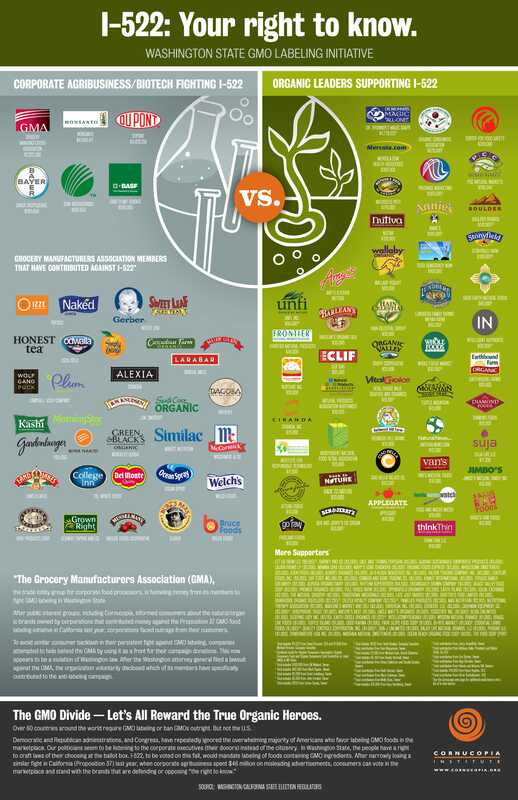 The food companies on the left of this graphic spent tens of millions of dollars in the last two labeling campaigns—in California and Washington State—to prevent you from knowing what's in your food. You can send a message right back to the GMA and its members who tried to deceive you by illegally hiding their campaign contributions by switching to the brands on the right; all of whom stood behind the I-522 Right to Know campaign. Voting with your pocketbook, at every meal, matters. It makes a huge difference. I also encourage you to continue educating yourself about our agriculture and food policies, and to share what you've learned with family and friends.